Streaming video users will reach 745 million customers around the world within five years, overtaking the declining global pay TV market, according to new research. The report, titled “TV is Total Video: Predicting OTT and the Future of Video Advertising” from UK analyst group Rethink Technology Research makes a five year forecast on global streaming. Rethink has tracked 280 streaming operators in 40 countries for this report and reported their SVoD subscribers alongside TV Everywhere regular users and found that towards the end of this 5 year forecast a combination of SVoD subscriptions and TV Everywhere users will reach 745 million customers in those 40 countries alone – something very close to the global pay TV market in unit numbers. Today there are 1 billion pay TV customers, but they are likely to enter a decline from their peak by 2022 and that decline is already visible in the US. SVoD will grow at just 9% CAGR to reach 476 million subscribers by the end of 2022, and TV Everywhere regular users (more than one visit a week) will reach 269 million. The US will remain the strongest SVoD region with 236 million subscribers, just over 50%, but TV Everywhere usage will be strongest in Europe, while Asia Pacific will dominate Advertising VoD, with over 1 billion accounts in China alone. AVoD was not counted in this forecast. To scale up SVoD number to the entire globe “Other countries” contribute a further 15% to the figure we have published, which makes 547 million SVoD customers globally across more than 200 countries and takes the total globally to 816 million, very close to overtaking pay TV. 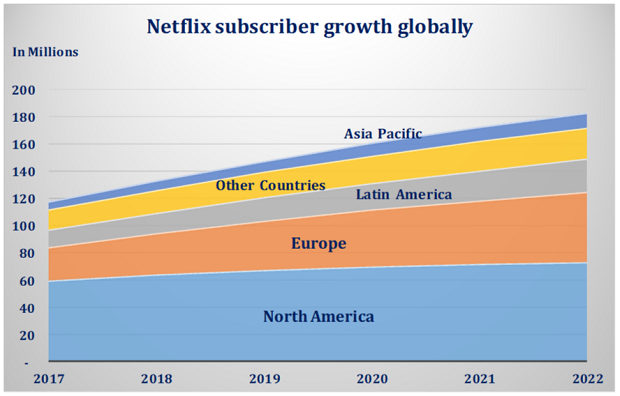 Just as they finished this report Netflix ended 2017 with a surprise for investors and followers of OTT video, leaping ahead of expectations and beginning to talk about where its next 100 million customers will come from. As a result its share price jumped 25% – almost, but not quite putting it out of reach of an Apple takeover – something rumored just weeks before the results.